Double vinyl LP pressing. 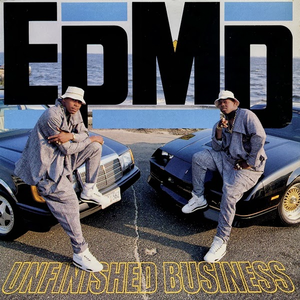 Unfinished Business is the second album from hip hop duo EPMD. Released August 1, 1989, the album built upon the success of the group's previous album Strictly Business, which was released the previous year. In 1998, the album was selected as one of The Source's 100 Best Rap Albums. EPMD is an American Hip Hop group from Brentwood, New York. The group's name is a concatenation of the members' names E and PMD or an acronym for "Erick and Parrish Making Dollars", referencing it's members, emcees Erick Sermon (AKA E Double) and Parrish Smith (AKA Parrish Mic Doc). EPMD is one of the most prominent acts in east coast hip hop. DJ K La Boss and DJ Scratch were DJs for the group.